The inherent beauty of the investment management profession is its applicability to all people. Investing requires a global perspective, and it transcends cultural, social, and economic boundaries. Investment professionals serve clients in multiple capacities across an organizational spectrum of boutiques, middle-market firms, and global financial institutions. Roughly 10,000 US residents will reach retirement age every day for the next decade and half. The number of Americans age 65 and older is expected to more than double by 2050 to 89 million people. Retirement income and longevity risk is now the responsibility of the employee rather than the employer. US 401(k) retirement assets currently exceed $4.4 trillion. The proliferation of exchange-traded funds (ETFs), the advent of self-directed brokerage, and the digital revolution create confusion for those attempting to make the most-informed investment decisions. The average lifespan of a company listed in the S&P 500 has significantly decreased from 67 years in the 1920s to 15 years today. There are more financial advisers over the age of 70 than under the age of 30. The average age of a financial adviser exceeds 50. Four out of 10 financial advisers will reach retirement age in the next 10 years, and 42% of this demographic lack a succession plan. The 2008 financial crisis and infamous individuals such as Bernie Madoff have eroded trust in the financial services industry. The investing public, as outlined by the Consumer Financial Protection Bureau (CFPB), is vulnerable to confusion about professional designations and certifications, which affords further credibility and trust to those who have earned the CFA charter. Congratulations! You are considering the merits and feasibility of launching your own investment advisory practice! In November 2013, after two years of preparation and planning, Marguerita Cheng and I co-founded Blue Ocean Global Wealth, an investment advisory firm that strives to be a trusted partner and educational resource. 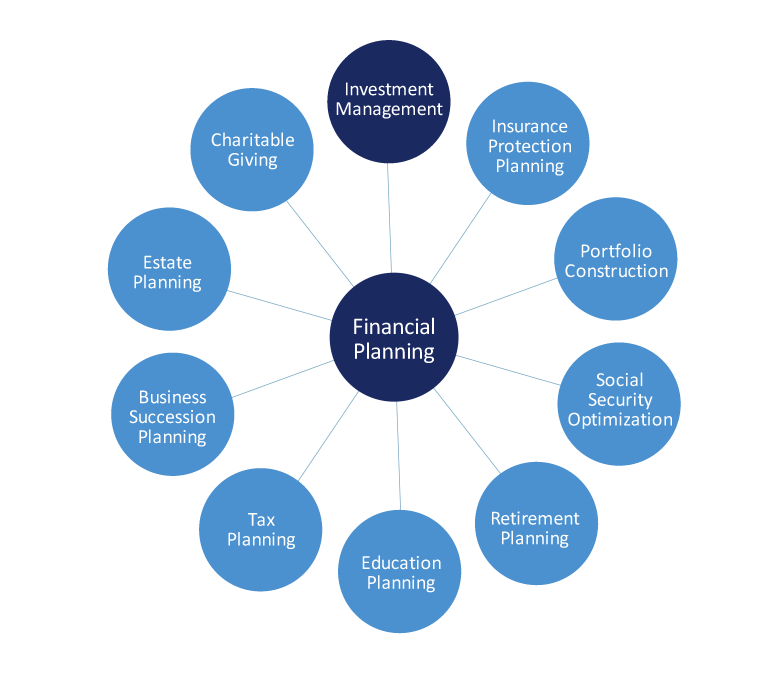 We deliver comprehensive financial planning and wealth management solutions to families, entrepreneurs, and executives. Based upon our experience, we provide a simple framework to help you make the most-informed decisions when considering your own firm. 1. How do you want to service your clients? Investment management or financial planning? As a CFA charterholder or CFA candidate, you may have a natural affinity for portfolio construction and asset allocation. It is important to note that creating an investment portfolio in isolation is not the same as financial planning. Determine if you want to simply focus on the investments or if you identify with a financial planning process, which integrates additional areas of financial life above portfolio management, including taxes, insurance, liabilities, budgeting, succession planning, estate planning, and charitable giving. 2. 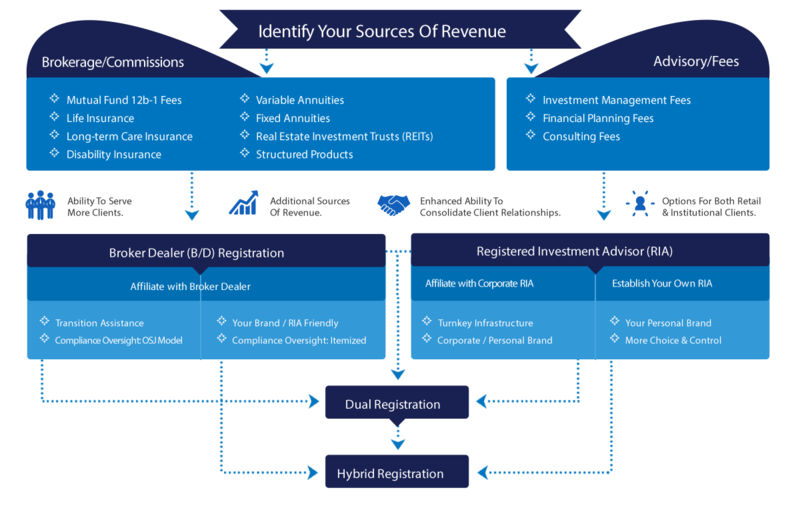 What is your future revenue model, advisory fees or brokerage commissions? The products and services you offer, and associated compensation received, will determine the optimal legal structure for your business. If you prefer fee-based or fee-only compensation, you will need to join an existing or create a Registered Investment Advisor (RIA). If you earn income from fees, you are considered an investment adviser. Depending on their size, investment advisers have to register with either the SEC or the state securities agency where they maintain their principal place of business. For the most part, investment advisers who manage $100 million or more in client assets must register with the SEC. If they manage less than $100 million, they must register with the state securities agency. Please note that fees may be structured as a flat amount or a percentage of assets under management. If you plan to receive commissions, you will need to affiliate with an existing broker-dealer to offer such products, which requires passing licensing exams, such as the Series 7. Flexibility to serve clients from a brokerage and advisory standpoint. Enhanced ability to consolidate client relationships. Versatility to provide options for both retail and institutional clients. 3. Consult a reputable compliance provider. Following the compliance rules and regulations is fundamental to the daily viability of your business. Navigating the regulatory landscape, at the state and federal level, can be complex and time consuming. Maintaining an in-house compliance department is often neither practical nor feasible. Establish best practices from the onset of your business so that you can focus on engaging clients and strategic partners. 4. Develop a business and marketing plan with a detailed timeline to prepare you for when you go live. Business Incorporation: If forming an RIA, name and register your entity after determining the right legal structure. Custodian: Selecting a reputable custodian is critical. Bernie Madoff, for example, held client assets in custody and was therefore able to manipulate values and account statements. We selected the Bank of New York Mellon (BNY), through their subsidiary Pershing Advisory Solutions, because they are the world’s largest custodian. BNY administers more than $29 trillion, or 20% of the world’s securities. We also found their global presence in key markets, such as London and India, advantageous for our long-term strategic plan. This line from history resonates with me and validates the importance of planning. Prepare for the opportunity. No matter how prepared you are, you may never feel you have prepared enough. When you have a flexible framework, it’s easier to stay focused on reaching your goals. An integrated plan will help you measure short- and medium-term progress toward realizing your long-term vision. Just as portfolio management may stipulate that an asset manager implement an “active” strategy within the guidelines of the investment policy statement, entrepreneurship will require you to adjust your plan on an ongoing basis. Educate yourself to be as knowledgeable as possible. By understanding your options, you’ll be better prepared to make informed decisions. Sameer Somal is the Chief Financial Officer at Blue Ocean Global Technology and Blue Ocean Global Wealth. Prior to co-founding Blue Ocean Global Wealth, he was a Senior Investment Analyst at The Bank of Nova Scotia and a Financial Advisor and Intermediary at Morgan Stanley and Merrill Lynch & Co. As part of the Investment Strategy Group at The Bank of Nova Scotia, Sameer actively contributed to the firm’s white paper and institutional business development efforts. He delivered keynote presentations and fostered education partnerships nationally. His fiduciary responsibility at Ernst & Young and Advisor Compliance Associates include helping asset management and alternative investment companies adapt to Sarbanes-Oxley. Sameer is a CFA Charterholder, a CFP® professional, and a Chartered Alternative Investment AnalystSM. Sameer serves on the Financial Planning Association (FPA) National Diversity Committee and the Board of Directors of the Philadelphia/Tri-State FPA. A senior financial services leader on industry roundtable and panel discussions, Sameer serves on CFP Board’s Council on Education and is a Women’s Initiative (WIN) Advocate. He is an active member at CFA Institute, serves on the Advisory Executive Council of the Women Economic Forum (WEF), and is a Board Advisor at the iPlan Education Institute in New Delhi, India. A member of the Speakers’ Series at the Johns Hopkins University Carey School of Business, Sameer is subject matter expert witness and a frequent speaker on the digital revolution, reputation management, succession planning, technology, diversity, financial planning, entrepreneurship, and leadership. In May of 2017, he was named an Iconic Leader Creating a Better World for All by the All Ladies League & Women Economic Forum. This is a very insightful article and came at the right time for some of us preparing to launch an investment advisory very soon. Thanks so very much Sameer for your thoughts. They are going to be very helpful especially for the preparation stage. I hope you don’t mind if I have to contact you for more insights. Laurence Brody I really liked this article and its timeliness. There will be continuing need for human relational financial advice. You will have to have the personality and confidence to attract clients. I think the Advocacy movement is for the present, but planning for the future and professional survivability is a better issue. If there are concerns about working for someone, a CFA member should consider starting their own firm, either solo, or with trusted partners. There can be great pleasure in creating your own corporate culture and ethical system. There will be a shock in terms of the compliance and legal attention needed. I think Sameer S. Somal makes a contribution for what younger members could be considering. Thanks Sameer. Pingback: 01/06/16 – Wednesday’s Interest-ing Reads | Compound Interest-ing! Thank you Sameer for this article. It is indeed timely as i am putting together an advisory and financial planning startup in Nigeria. The regulatory framework and operating landscape for advisory-type businesses is not cast in stone so i have had to look at other jurisdictions. I am happy i stumbled on your write-up as it is helping in conceptualizing my business. We are far from where we want to be but believe we are on the right track. I am having challenges with sourcing for business or clients, might you have any insights in this regard? Will be happy to read from you. Thanks Sameer, your write-up has answered many questions I have looking into. A very concise and insightful article.